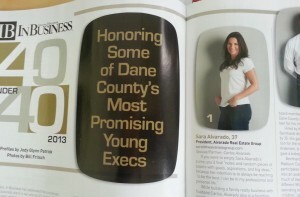 Congratulations to Sara Alvarado, President of Alvarado Real Estate Group, for her recent accomplishment of making it into the 2013 Class of 40 Under 40: Dane County's Most Promising Leaders. "For 13 years, In Business has celebrated the successes of rising business stars in our annual 40 Under 40 issue, and each year we have marveled at the vast richness and diversity of the young candidates. The competition is stiff. Not only are we looking for examples of business success and moxie, but also for people who demonstrate a firm commitment to the local community through board involvement, volunteerism, or other activities." "It is a huge honor for me to be part of this group of young leaders, and I like to emphasize the word young! My parents raised me to always be looking at the whole picture. I have never had my work life, personal life, volunteer life in separate compartments. My life is my life and when I feel strongly about something and feel the need to get involved, I jump in. 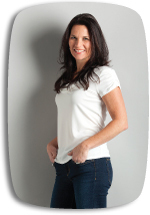 Luckily with the real estate business my husband and I have created, we have figured out how to make it possible to be very involved in our community through the passions, time and resources we can give. It is how our family chooses to live. To be honored by the In Business community for not only leading in business but also in our commitment to our community feels wonderful. I hope it encourages all business professionals to look closely at where they can give back in a meaningful way. Because giving is really a huge dose of receiving."